Alec Bohm from the. 2018 Bowman Draft Picks &. 25 card lot of. I cannot fix what I am not aware of. Prospects baseball card series. Free---Sleeves toploader s team set bag envelope. the cards are PERFECT. Have worked hard to achieve this number. These cards are solid.no body creasesno crushed cards, highly collectible. Backs are clean! No creased junk slipped into the back (I don't do that!). What you see is what you will receive! 2016 Aaron Nola baseball RC lot. The 9 RC's are in NM condition. Cards range from Near Mint to Mint Condition. ATOMIC REFRACTOR. SEE SCAN FOR CONDITION. (12) Andrew McCutchen Card Lot! (1) Jersey Card (5) Rookie Cards + (6) Inserts!! (12) Andrew McCutchen Baseball Card Lot! (2 ) 2008 Bowman ROOKIE Cards #BDPP69! The cards appear to be in mint condition but s. 2013 Finest Card #13! The Cards Are All of the cards are pictured. Rhys Hoskins. 2014 Bowman Draft Baseball. Jumbo Case Break Lot. The stars are as follows These cards are very nice. They have no creasing and most are slightly off-centered (SEE PICs). The backs are mostly clean. Actual cards pictured are the ones you will receive. Cards in this lot includes the following numbers # 587,167,345,324. 83 Donruss #53 Gaetti RC. 83 Fleer #625 Viola RC 2X'S. 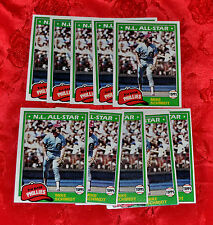 1983 rookie lot cards are in NMT condition. 9 rookie cards for 1 low price. MATT VIERLING 1st BOWMAN AUTO REFRACTOR. SIXTO SANCHEZ# 165/499 BLUE SKY PAPER. You are purchasing a lot of 30 total 2018 LUIS GARCIA Bowman Prospects Rookie Cards! Card #BP75 in the set. Steve Carlton 4 Card Lot. Assorted Legacy & Insert Cards. Philadelphia Phillies. This 3 card lot includes the following cards (only ONE (1) Autographed card) all of Rhys Hoskins. Lot of 21 Philadelphia Phillies baseball cards all shown in 3 scans. This is a lot of 21 baseball cards, they date from 1985 to 2015. All players in Phillies uniforms. All 21 cards are shown in the 3 scans, in excellent condition. Scott Kingery (Philadelphia Phillies) 15 Card Lot W/ Rookies! 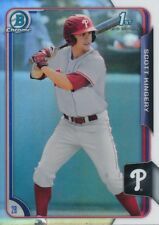 YOU ARE BUYING THE 15 CARDS OF PHILADELPHIA PHILLIES STAR, SCOTT KINGERY THAT ARE SHOWN IN THE SCAN/PICTURE,including Rookies! All rookies and inserts will be ones shown! There are no duplicate cards in this lot! 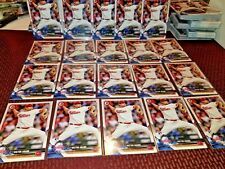 You are buying a JP Crawford 2015 Bowman Draft #25, Lot of 195 Total Cards, Phillies. I am sorry but they have just increased to much. WHICH IS A FREQUENT OCCURRENCE IN THE PRODUCTION OF CARDS AS THE MANUFACTURERS HAVE NOT PERFECTED A SOLUTION TO THIS PROBLEM. YOU ARE BUYING ONLY THE: DALRYMPLE. CONDITION: NEAR MINT -. #206 Jimmy Rollins. This lot contains the following players #33 Cliff Lee. #26 Chase Utley. #71 Kyle Kendrick. 1977 MSA Welch's Cup - TOUGH! - nice shape - stats from 1976. Gillette All Star ballots - unused. All different. 1967 Reds – ruler – all players pictured – alphabetically – includes: Cardenas. 1982 Creative Education – book – Phillies – Rose on cover – little wear. 50 BASE CARDS =50 TOTAL CARD LOT! Up for sale is a 20 card lot of 2018 Bowman Rookie baseball cards of NICK WILLIAMS RC #73. Jean Segura 2019 TOPPS OPENING DAY BASE CARD LOT of 2 PHILLIES. Condition is Brand New. Shipped with USPS Parcel Select Ground. Nice lot of 25 all different baseball cards of MIKE SCHMIDT. Cards average nr/mint condition and again, no duplicates. Here is an instant collection, the work has been done for you. You are buying the 31 cards of Philadelphia Phillies star pitcher, Aaron Nola that are shown in the scan/picture, including rookies, inserts & refractors! All rookies and inserts will be ones shown! BRYCE HARPER . REFRACTORS & ATOMIC REFRACTORS. CARD LOT PICTURED OF. 1 TOP LOADER WITH THICK BLANK. Bryce Harper 2018 DONRUSS OPTIC PINK PRIZM PARALLEL #157 Base Phillies. Condition is Like New. Shipped with USPS First Class Package. rare black RC from Base Topps 01/64 All cards NM-MT unless otherwise noted. Card will ship USPS w delivery confirmation within 2 days of receiving payment. Cards are in Mint/Near Mint condition as seen in the enclosed scan. All rookies and inserts will be ones shown! There are no duplicate cards in this lot! #409 - Scott Kingery - RC - X2. #11 - Aaron Nola. Philadelphia Phillies Cards. #339 - Philadelphia Phillies - Team Card. Cards arenot individually numbered. #26 - Cesar Hernandez. --- Cards included in this lot ---. 1976 MSA Safelon Lunch bag – w/Tug McGraw on opposite side. All different. 1977 RC Cola can – lite wear, slight print flaw on cheek – steel can – top opened. 1984 Wichita Eagle Beacon 3-card bubblegumless strip – w/date of issue present -. MLB’s Philadelphia Phillies baseball 17 card lot. You will receive exactly what is pictured. *Card will ship in a top loader in plain white envelope. * Thanks for looking and happy bidding! Rhys Hoskins (Philadelphia Phillies) 8 Card Lot W/Rookies! YOU ARE BUYING THE 8 CARDS OF PHILADELPHIA PHILLIES STAR, RHYS HOSKINS THAT ARE SHOWN IN THE SCAN/PICTURE, INCLUDING ROOKIES. All rookies and inserts will be ones shown! There are no duplicate cards in this lot!